Blake Koch picked up the 2nd last-place finish of his NASCAR Camping World Truck Series career in Friday’s Lucas Oil 150 at the Phoenix International Raceway when his #0 Koma Unwind Relaxation Drink Ford fell out with suspension problems after he completed 2 of the race’s 153 laps. The finish was Koch’s second of 2012, his first since Kentucky, five races ago. Koch qualified 29th in the 36-truck field at an average speed of 129.273 mph, ranking him ninth among the thirteen go-or-go-homers who attempted to qualify. Koch also bumped team owner Jennifer Jo Cobb from the field as Jo Cobb’s #10 turned in the slowest speed in qualifying. Koch’s truck was the first to fall out in the race itself, followed two laps later by Chris Jones, who was driving the #38 RSS Racing Chevrolet which racked up a series-leading four last-place finishes in 2012. 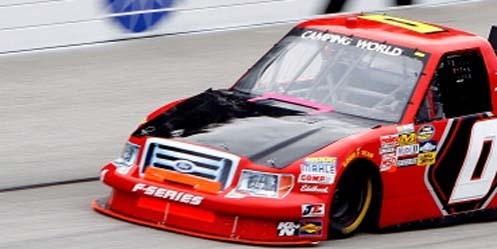 Finishing 32nd was Dennis Setzer, who racked up his twelfth bottom-five finish of 2012 and his first-ever LASTCAR Truck Series Championship. All the other two-time last-place finishers this season who were in a position to tie Setzer at Homestead cannot win the tiebreaker as all of them have ten or fewer starts, and therefore less than twelve bottom-fives. The #38 Truck Series team has also locked-up the LASTCAR Owner’s Title as they lead the runner-up #0 team in bottom-fives at a total of 13-9. *This was the first Truck Series last-place finish for the #0 at Phoenix since 2008, when Butch Miller’s ASI Limited Chevrolet was involved in a multi-truck crash after five laps of the Lucas Oil 150. In the body of the post you have Setzer with a 39th place finish, and it should be 32nd. You counted 4 back from 43 instead of 36, the truck series start count. BTW, this is a great site & I really enjoy all the hard work you've put into it. Thanks for another great LASTCAR season. Believe me, it's been a LONG season.